The Poisson D’Avril Bubble Bar translates from French to English as ‘April Fish’, which, to this day, remains the French term for April Fools. I did a little research into the inspiration of this never-before-been-released bubble bar, I just love learning of how and where Lush pull their product-creation inspiration from. The last product that got me researching like this was the Cyanide Pill bath bomb, I love learning just as much as I like Lushing! Poisson D’Avril is a part of Lush’s beautiful and bright Easter 2018 line. Back in 1564 King Charles XIV of France reformed the calendar to what we go by today, back then news took a lot longer to spread. HOW DID ANYONE GET THROUGH EVEN AN HOUR WITHOUT WIFI?!!! The people that lived in the rural areas of France were the last to hear of the new calendar. Just like the people of today many of them hated change. Moving away from the unwanted history lesson ~ I know you’re only here for the Lush! Poisson D’Avril is a red and orange/yellow, fish shaped bubble bar. Its ingredients include neroli, cinnamon leaf and black pepper oil. It wasn’t until I used Poisson D’Avril with the New shampoo bar that I realised it was a fruity AND spicy scented product. I don’t know how I even missed its spicier notes at first, sniffing it now, it’s so obvious. On paper the ingredients list appears a little crazy, I however feel that Poisson D’Avril is one of the best smelling bubble bars Lush have made to date. It reminds me of several different products, there’s elements of the Dragon’s Egg bath bomb in there as well as elements of the Christmas Sweater bath bomb too, both might I add pair beautifully with Poisson D’Avril. Its scent is warm and citrusy but not in an in-your-face way, in my opinion it’s the perfect balance of both. It’s fruity enough to leave you and your skin feeling brighter, yet warm enough to banish away any lingering Winter time blues. Laying back in a Poisson D’Avril bubble bath is the perfect way to say goodbye to Winter and hello to Spring. Although Poisson D’Avril is in my opinion a larger bubble bar, I have found that to experience it at its full potential you should only really split it over 2 baths. I know some people have used the whole thing for one bath, a true Lush extravagance that I will not be willing to embrace unless the Poisson D’Avril becomes regular line, *hint, hint Lush. * I always get so sad at the thought of so many wonderful products only being available for a short amount of time, even more so now the Lush Kitchen is no longer a weekly affair. Just half of the Poisson D’Avril crumbled under a hot, running tap creates mounds of fluffy white bubbles. Underneath the thick blanket of bubbles is the most dazzling of water. It’s not only a brilliant shade of red but also speckled with a slight golden lustre too. Its scent isn’t very strong on the skin once you get out of the bath, it is however still ever so slightly detectable the morning after using it. I’d do absolutely anything to get hold of a body lotion in the Poisson D’Avril’s scent. Although I’d have naturally wanted for Poisson D’Avril to be a bubble bar I could spread out over several baths, I did enjoy using it thoroughly, so much so that I have ordered several more. I just had to stock up on them as I know that I’ll be more than sad to see the Poisson D’Avril bubble bar go once Easter 2018 is through. The April Showers Bath Bomb is a brand new release from Lush, it’s a part of Lush’s Easter 2018 range and I have to say that this year’s collection (the bath bomb’s in particular) are so much better than last years! for me personally, I quite like a wide variety of choices when it comes down to bath bombs. Sometimes you crave a bold and colourful bath and other times you just want something a little more relaxed, be that a cooler more calmer scent or even just a gentler bath product that maybe displays less colour. April Showers is a white, cloud shaped bath bomb that is decorated with pink and purple, raindrop-shaped bath melts. I ignorantly didn’t even realise that the raindrops were actually bath melts until I had used it. With the Ultra Violet bubble bar not making a return yet again and the Baa Bar bubble bars recent change of ingredients April Showers is the go-to violet scented item in this years Spring collection. I find April Showers scent to be an incredibly strong and very dry violet based one, not unlike the Ne Worry Pas bath bomb, it is however so much more in-your-face strong. Once I had put the April Showers bath bomb in the bath the scent intensified even more. I normally always stock up on any Springtime products with violet in as they tend to really help with my migraines. With April Showers scent being so much stronger than I am used to unfortunately it doesn’t really help me with my migraines, this doesn’t mean it doesn’t make a good bath though! True, I am disappointed to no longer have a violet based product that helps with my migraines readily available, this however doesn’t take anything away from how much I like this new Lush bath bomb. As I had predicted April Showers was a fairly quick fizzer, what I didn’t expect from it was such beautiful bath art. As mentioned above the pink and purple raindrops that decorate the April Showers bath bomb are in fact bath melts. It reminded me of the Lava Lamp bath bomb (but you’ll be pleased to hear) is a much easier clean up! – pink and purple oil decorate the milky violet water. I felt myself instantly relax when I lay back in its waters. Its scent also stayed on my skin too. Once out of the bath, the intensity of the scent did dampen down on my skin it was however still noticeable the morning after which started my day off with me feeling just as relaxed as I was when I first got in the April Showers bath the night before. Although April Showers isn’t the most eye catching of products upon first glance, it puts on such an amazing show. I am stocking up on this product before Easter is through, I love how unique it is, please try it, it’s a beautiful addition to the Easter 2018 product line. I always get ridiculously over excited when a new Lush shower gel or cream is released. Shower gels don’t have as much wow factor as the Lush bath bombs do and I think that’s what makes me like them so much. When I first got into Lush I ignorantly focused all of my attention on to the bath bombs and bubble bars, it wasn’t until I had explored those products that I began to crave more. 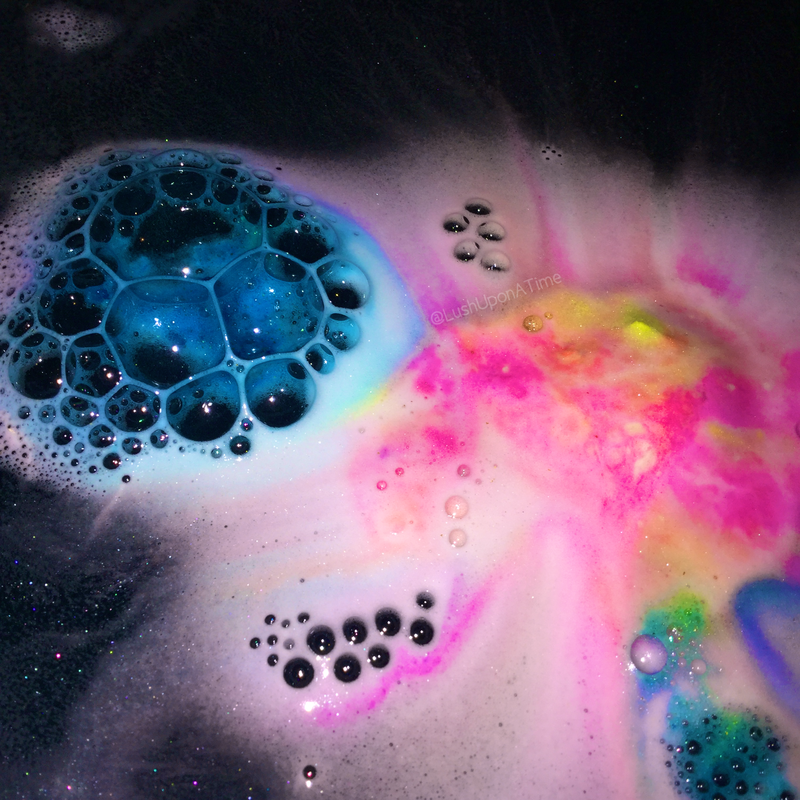 It wasn’t long until all of the scents and colours of the bath bomb and bubble bars had completely seduced me leaving me wanting anything and everything Lush… Enter Lush shower gel! My very first Lush shower gel was Twilight. Our pairing obviously went off with a bang and ever since I’ve sought after every Lush shower gel I can get my hands on. This Easter (2017) Lush decided to bring out a limited edition, brand new shower gel called Wash Behind Your Ears. The Wash Behind Your Ears Shower Gel is a bold and very bright orange fitting in perfectly with the Springtime and Easter holidays. What has surprised so many people about it is that it, (just like the Flopsy face wash jelly) contains carrot infusion. Unfortunately I have heard very mixed reviews on Wash Behind Your Ears, some have said its scent is dull, others say it just smells like carrot. I have also heard that its texture is more creamy than most shower gels. Do I agree with any of the above statements? Yes I do – but not all of them! Wash Behind Your Ears does have a very creamy texture in comparison to some of Lush’s other shower gels, I however find that it lathers up very quickly which is the opposite trait to most Lush shower creams. What I find most satisfying about its texture is that the smallest amount seems to go a very long way. Although most people tend to overindulge with the liquid products, squeezing out more than they actually need you really do not need to do this with Wash Behind Your Ears. I can see one 250g bottle of it lasting me for more than 6 months with everyday use. Dull is the wrong word to describe its scent, it’s not as attention grabbing or dominant as the likes of Plum Rain or Snow Fairy but it isn’t dull. Subtle is a more accurate way of describing its scent. It actually has quite a soft floral air about it and I personally cannot identify any carrot. It does however have a root vegetable element to its scent, one that reminds me of prepared, raw root vegetables such as the parsnip. I have only ever thought this about one other product and that was the Magic bath bomb. I get that my use of the word ‘parsnip’ may put some people off, as the thought of rubbing parsnips all over your body isn’t very exciting at all. Please don’t be put off by my comparison though, root veg vibes or no root veg vibes with its added floral undertones the scent really does work. If you’re a Lushie that prefers the softer scents Wash Behind Your Ears may just be the perfect shower gel for you. Although Wash Behind Your Ears didn’t woo me in quite the same way as the Hot Toddy shower gel did, I didn’t dislike it. I also do not think it deserves the amount of negative attention that it got, it is a very efficient shower gel that brightens and refreshes my skin with long lasting effects. I wouldn’t miss it if it didn’t come back again but I did buy an extra bottle to keep in my Lush storage!